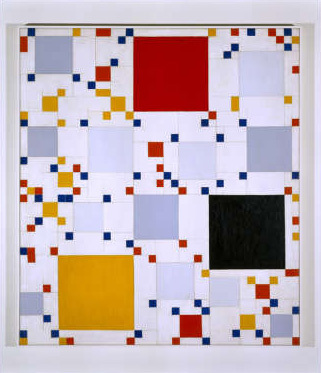 It’s hard not to see the reasoning behind that quote from the Mondrian-acolyte painter Leon Polk Smith when you learn that he grew up amidst the gridded fields of Oklahoma before moving to New York City. But it’s instructive in another way. The physical city certainly is the expression of abstract things. The desires of its inhabitants, the collective aesthetic of cultures, the movement of goods, the education, safety, and utilities that strengthen or weaken it. What’s been missing is a good way to describe that equation. And that’s why I’m pleased to have been a part of the development of City Forward. This site is a first step in aggregating, visualizing, and socializing the abstract vital signs of cities worldwide to permit a better understanding of the world we live in. It’s rich with functionality — honed over many months with amazing feedback from our beta community — to provide a single place to work with the data our cities are opening up. We’re not alone in this endeavor and we hope to play a critical role in the ecosystem of applications that are making public data more useful, insightful, and actionable. City Forward has a lot to offer. 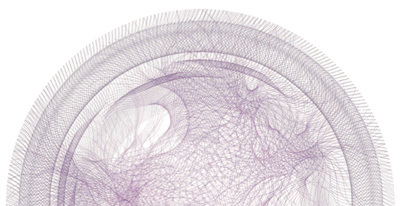 I encourage you to watch the video) and to create your own explorations of the data within. Help us find the equations so we can describe a better future for our metropolitan regions. Over there, a woman’s walking down a city sidewalk. 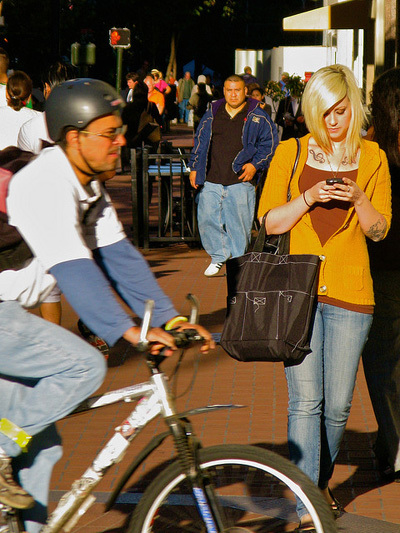 She’s doing all kinds of things at once: walking, texting, presumably not being hit by a biker, even perhaps being stalked. Framing this in terms of interaction design, we might think of it as a moment of simultaneous navigation of multiple information interfaces. One of these interfaces is rarely thought of as such; it is the skin of the built world: the sidewalk, curbs, building entrances, shop windows, signage, and welter of moving elements (human and machine) that cross her path. Another is digital: the menus of an iPod, or an application on a smartphone, a GPS map, an SMS keyboard. Thinking more deeply about only these two — the interface of the street and of her device — it’s clear we’re considering two highly designed modes of interaction. The first by architects and city planners, the second by computer engineers and UI designers. Millions of times a day in a single city these two interaction modalities are layered on top of one another. Now consider that the two communities of practice that develop these interfaces rarely interact, much less formally share knowledge or design in tandem. This is a problem, for both communities partake of city-making. There aren’t many truly complex things the human race has been making longer than cities which is why it seems irresponsible to me that the participants in what Adam Greenfield calls we seek to learn from the mistakes we’ve made with the built environment. Let’s use one example that currently enjoys a lot of debate and which has had a direct impact on the above pedestrian scenario: urban highways and the various movements to undo them. Planning for urban freeways in the first half of last century is often obscured by the white-hot glare of construction that followed from the US Federal Highway Act of 1956. Early 20th century designs emphasized intra-metropolitan mobility, supplementing the dense grid of cities with multiple interchanges, relatively small facilities, and overall attention to harmonizing with the urban fabric (as with multiple central parkways, in the map above). 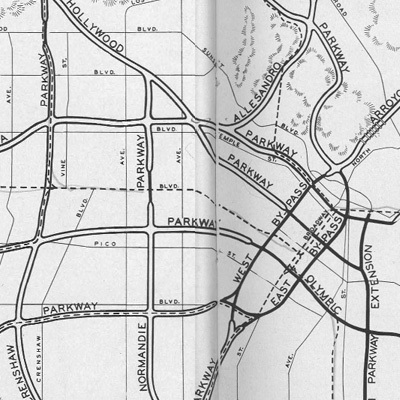 These early freeway designswere built to integrate holistically with other modes of transportation such as railways and bus lines and some even included land redevelopment as part of the construction plan. Because these plans grew from the city itself so, at this point, did the funding mechanism: property taxation, bonds, and special assessment districts (source: JAPA, “Planning for Cars in Cities,” Brown et al, 2009). This mostly-local method of funding was not adequate to the scale of superhighway infrastructure being planned and so the trajectory of development followed a different course. With centralized funding from the federal Highway Act, itself fueled by new gasoline taxes, the engine of interstate highway construction roared to life. The arteries being built — call them vehicular broadband — eventually stretched through and into the nation’s cities, despite Eisenhower’s initial plan to terminate them at city limits. 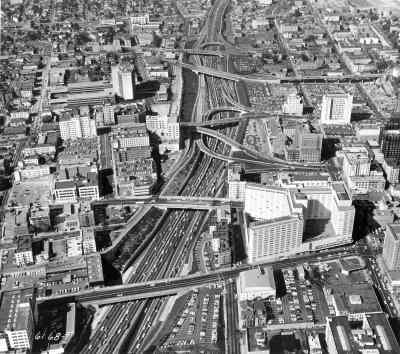 As the responsibility for construction fell to federal engineers with a different set of priorities than local city planners, nuanced integration of the highways with the urban landscape was largely forgotten. There was a lot to praise about the Interstate Highway System. High-speed transit and increased mobility changed the very culture of America, permitting easier mobility, increased opportunities for employment, and a broader discovery of the nation itself. But these highways had unintended consequences too. The demand for destinations along the highways induced a period of development that has led to sprawl, exurbia, and an entire class of highway-only development. In urban areas the effects were compounded by the density of travelers, leading to congestion and pollution. Worst of all from the holistic perspective of the city, urban highways sliced through neighborhoods, disconnecting the human-scale interactions and pedestrian mobility that had defined the street-level vitality of city life. Urban highways often blighted, segregated, or simply erased communities while creating both a physical and psychological barrier to local movement. By the end of the 20th century some municipalities had come to understand the adverse consequences of urban highways. Portland led the way in 1974 with the demolition of its Harbor Drive Freeway. Other highway removals or reroutings included the West Side Elevated Highway in NYC (after a collapse and contentious public debate), the Park East Freeway in Milwaukee, the Embarcadero Freeway in SF, and most famously the burying of the I-93 highway in Boston known as the Big Dig. Though all related to unmaking highways, these projects were the result of quite different initial circumstances, engineering approaches, and political machination. And yet each project was an attempt to undo damage done to the urban fabric, to correct a mistake. What might we learn from these examples as we consider the information architecture of cities? (1) Unintended consequences accompany any design of a complex system. It would be hard to argue that designers intended the linear parking lots that many of our city freeways have become. They simply did not understand the nature of induced demand: build it and they will come — at which point you’ll learn that you didn’t build it big enough. This is cyclic, congestion-abetting design, however unintended. 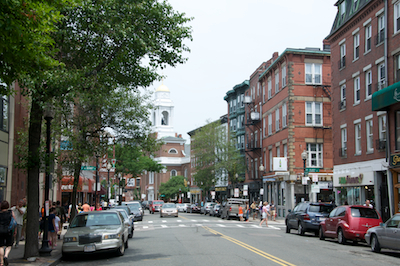 The North End’s Little Italy neighborhood is arguably the most authentic in the US. The scale of interaction is utterly human, its streets and buildings echos of usage rather than overlaid standardization. One need only look to the Disneyfied Faneuil Hall marketplace just to the south to see what commercial development of a historic area could have meant for the North End. The urban freeway as an unintended factor in historic preservation. Left: I-93 cutting through Boston's central business district. Right: The Rose Kennedy Greenway built atop the buried highway. But I-93 has been buried and the barrier to pedestrian movement to the North End is mostly gone. And so is the barrier, perceived or real, to the forces of gentrification and large-scale development that characterize so many historic districts today. The consequences of this remain to be seen. So, while technology does not seem to offer short-term hope for predicting the unintended in complex systems, the invisible architecture of data and services does afford more nimble rearrangement and redeployment than do viaducts of concrete or steel girders, at least in theory. Cities, of course, are a model of resilience. Buildings learn, the street finds a way, patterns of usage can be reshaped — albeit with the pace of a medium made of brick and mortar. In this way, but with far more speed and flexibility, the architecture of information and services in cities can be built not to prevent unintended outcomes but to enable them. If we agree that inadvertent outcomes are unavoidable in sufficiently complex systems such as cities, then the opportunity we’re presented with in matters of digital design — the lesson, so to say — is that extensibility should be a primary goal. It must, above all, encourage adaptation. (2) Throughput is not connectivity. It seems likewise simple enough to note that vehicular broadband (a measure of volume-over-time) is not the same thing as mobile connectivity. Yet this misunderstanding — or willful blurring of two very different things — is the mulch from which so many problems with urban freeways grew. Plowing into the dense grid of local thoroughfares, superhighways sacrificed distributed human-scale connectivity of points A through Z for high throughput from point A to point B. Cities have always been proto-internets of connection and interaction. There’s never only one way to arrive at a destination in a city; multiple routes make cities both diverse and fault-tolerant. But if we extend this analogy — or, rather, make it less of an analogy — to think of cities as information-processing machines, there are some fairly clear lessons to be drawn as we consider communications broadband and the larger implications it has for community connectivity. Urban waterways, roads, and rail links are all networks of information as well as of goods. There’s value in these networks: information is moved, consumed, changed, combined and created. But there’s a finer level of detail too: at the human scale value is created by observation, being observed, and chance encounter. It’s a physical infrastructure that permits multiple channels of information flow — and this makes for a more efficient, diverse, and redundant system. In their excellent Information Architecture of Cities L. Andrew Coward and Nikos A. Salingaros make this point most forcefully, assigning the term “fractal loading” to the ability of a single channel (in this case a sidewalk) to carry multiple forms of interaction. 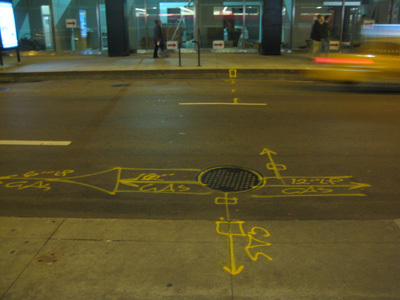 A primary information exchange is a pedestrian going from one point to another. He or she observes things that are unrelated to the primary reason for movement. This information is functional; it can recommend secondary behaviors to the observer who is executing a primary information exchange. A successful city is one in which even simple movements are a rich and rewarding experience. Urban space therefore works by violating the “functional” rule of twentieth-century planning. Successful urban geometry serves a multitude of needs on distinct scales; some strictly functional and others pleasurable. Walking to an appointment in a European capital (indeed, in most of the world’s cities) can be more pleasant than a drive to achieve the same end in a North American metropolitan area. In the former case, one sees other people, some of whom one might wish to talk to; observing others may provide clues on social currents and interactions; window displays provide information on available products and services, etc…. Fractal loading has the crucial feature that removing the largest level of scale leaves all the other smaller levels of scale intact. Not having to execute a definite errand, undirected wandering in informationally-rich cities allows the visitor to accept recommendations offered by different visual environments, and to discover the results of such movement. It is thus possible to learn the rich and complex “visual language” of an unfamiliar city that has only changed gradually over hundreds of years. By contrast, in a non-fractal deterministic environment lacking all lower levels of scale, if you don’t need to go somewhere, you will most certainly avoid doing so — every movement is a chore, with nothing new to learn. Non-fractal, deterministic, monofunctional — all descriptors for urban freeways, inhibitors to the kind of freeform interaction that have characterized cities from their inception. 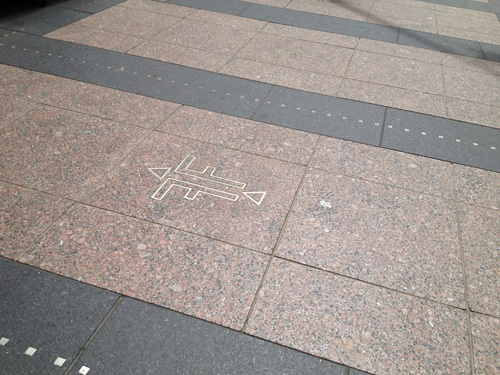 The lesson for digital design for urban spaces is less obvious than it seems. Certainly there’s a corollary that can be made between the coming of vehicular broadband and communications broadband to the inner city. But the repercussions are not the same. Neighborhoods that lay in the path of urban freeways were ripped asunder in a way that fiber optic cables coming through will not do. What we learn from a privileging of throughput over interconnection is that both are needed. Too often our discussion of the digital divide of connectivity focuses on getting the bandwidth in, leaving how it will be distributed and, most importantly, why it matters as an afterthought. For broadband to catalyze community and development in a city, an architecture that foregrounds people-centric interconnection needs to be laid. (We might call this second kind of digital divide one of digital literacy.) Otherwise it is just a wide pipe of little relevance, such as freeways that stretched to the coasts must have seemed to the people that experienced their ill-effects at street level. 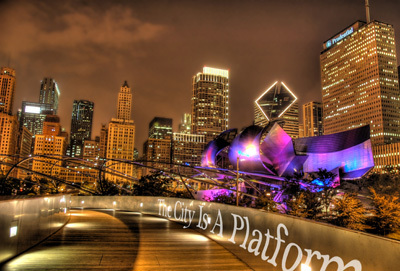 There’s a good deal of funding available for broadband and urban initiatives such as Chicago’s Smart Communities Program seem like the beginning of an understanding of the local, small-scale work required to capitalize on large-scale connectivity. As more of the city itself becomes part of the network and as we move away from thinking of computers and mobile devices as the sole points of tangency of interaction we must remember that throughput means nothing without a diverse set of input/output choices. (3) Catastrophic failure is an opportunity. This should sound a chord familiar to those who preach “never waste a good crisis” in our current economic recession and it isn’t particularly novel — but the kinds of catastrophes that have befallen urban freeways is instructive. Firstly there’s structural collapse. By definition urban freeways are grade-separated; it’s the whole point of permitting faster travel without colliding with local traffic. But this separation incurs engineering complexity and where there’s complexity there’s failure. 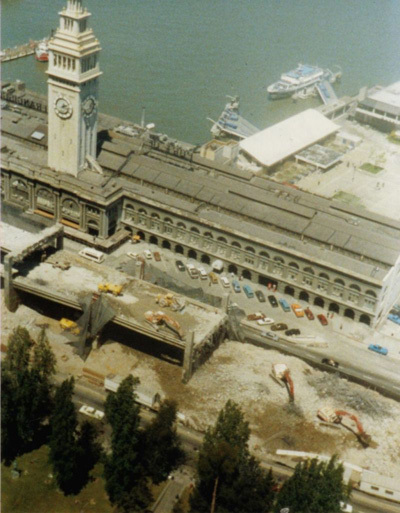 The 1989 Loma Prieta earthquake damaged transportation infrastructure throughout the Bay Area, prompting dozens of large-scale changes to urban connectors and bridges. One damaged artery, the Embarcadero Freeway, had been the focus of a failed campaign years earlier to demolish it and reconnect the city waterfront to its downtown. Even with the collapse, citizen opposition to demolition remained high (especially among local merchants who feared that the effects of the earthquake on their business would never abate if the freeway were not rebuilt). Eventually public opposition diminished and dismantlement begin in 1991. The ultimate demise of New York City’s West Side Elevated Highway began in 1973, ironically, when a dump truck overladen with asphalt for repairs to the roadway caused part of the upper deck to collapse. Unintended outcome, indeed. These failures were moments that demanded city leadership and community involvement. They forced people to think deeply about the effects of city freeways in a way that rarely occurs when a system is functioning nominally (if not optimally). Yet a less obvious form of catastrophic failure — social and environmental — characterizes urban freeways. These are slow-burning effects, and much-contested, but their cumulative effect (vehicle exhaust on public health, economic depression of formerly vibrant areas, cultural fragmentation) often amounts to a more powerful argument for redress than even collapse. And the solutions often solve more than the immediate problem. That is, when the problem is understood as not being solely one of engineering, having wide-ranging effects, the solution can be crafted to address the broader systemic ramifications. Our urban information architectures have not yet suffered such catastrophe, but we should be mindful that the potential for such in a hyper-connected world of interactive urban elements lends itself even more readily to system failure. Certainly this is a lesson in redundant design, but more than anything it should highlight the infrequent opportunity that large-scale failure presents to those who envision a different way. In addition to planning for system failure of our nascent networked urban spaces we need also to look to the already-built failures of the tangible city for opportunities to redress them in new ways. (4) All change is system-wide change. Too often urban roadway remediation focuses narrowly on the merely infrastructural when really what needs undoing are the broader systemic effects. One way to visualize the myriad follow-on effects of changes in a city is the practice of system dynamics. 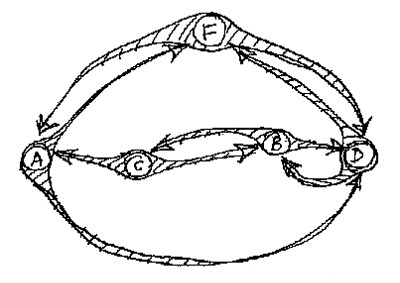 This approach, which uses positive and negative “causal loops” to show interconnection, has a varied history in its application to urban matters, but has received renewed interest of late with the sheer amount of data at our disposal and the maturing of analytical tools. Consider this often-used example of system dynamics at its most basic. 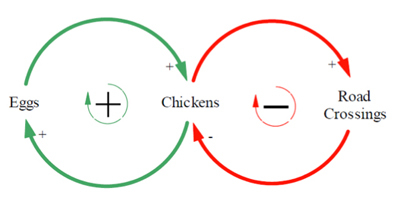 An increase in eggs forms a positive causal loop because it yields more chickens which also yields more eggs, closing the loop. Yet more chickens invariably leads to more road crossings (a positive vector), but more road crossings (i.e., encounters with motor vehicles) diminish the number of chickens, which closes the loop negatively. For this linked dynamic not to collapse on itself the number of chickens created from eggs needs to be greater than the rate at which they are killed off by getting to the other side of the road. And of course, this chart is unrealistically simplistic. 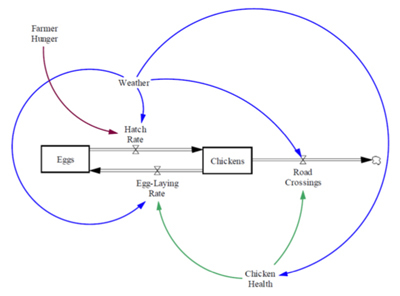 This loop introduces variables in the process of eggs becoming chickens, including hatch rate and egg-laying rate, which are influenced by farmer hunger, weather, and chicken health — the last two of which are also variables in the frequency of road crossings (i.e., less when the weather is poor or chickens are not strong enough to make the journey). Now imagine we’re not trying to map chickens crossing roads, but people, goods, and automobiles transiting a network of roads, each with different constraints and affordances. It’s the realm of the hellishly complex — though not necessarily chaotically so. It can be mapped and it is being mapped (trust me on this one), but the point is that, well before the graph looks like a spaghetti bowl, it becomes apparent that there’s no such thing as an independent action much less an independent system in a city. The Big Dig and burying of the Central Artery in Boston is again instructive. 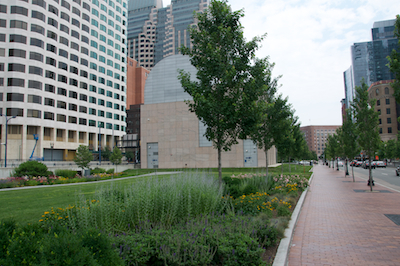 Where once the elevated highway ran right through downtown is now a linear park system known as the Rose Kennedy Greenway. It’s a beautiful, mostly green strip of reclaimed space that, for every instance you’re reminded of how much more they could have done with it, you’re equally impressed that it was done at all. But it is a perfect example that removing a variable from a system (in this case the highway itself) does not remove its effects. Downtown Boston spent over a half century responding architecturally, psychologically, and socially to the highway that carved through it. Much of this response consisted of ways of actively avoiding it, crafting better views, or leaving the area altogether for less fumy, congested climes. Put another way, the elevated Central Artery caused secondary growth patterns around it like a fencepost that alters the growth of a tree. Remove the post and the tree’s still warped. 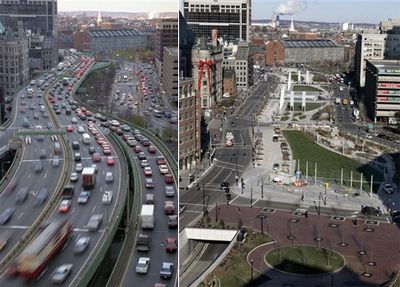 The Rose Kennedy Greenway (top image) does not re-establish human-scale transit in the way that existed before the coming of the highway or as it does in the North End (bottom image) because the Big Dig did not concern itself with the secondary effects — the cross-system effects — on the urban tissue surrounding the highway. The Greenway is a phantom limb, a linear park that too precisely echoes a well-landscaped median, which still serves as what Kevin Lynch described as an “edge” (though not nearly in the way that the elevated roadway did). The bitter irony is that the structures that were built to limn the edges of the Central Artery mostly turned away from it (towards the water or downtown), or thrust upward, or engaged in businesses that had no need for street-level interaction. These remain today and are a primary reason that the Greenway has not fulfilled its potential. The lesson here? More explicitly than anything in the built environment, technologies of networked interaction cut across multiple systems. Effects ramify outward from causes much more rapidly, potentially causing cascading failure or outage. To understand the city as a system of interdependent systems should be the foundation of any information architecture that seeks, as Adam Greenfield puts it, to enable “lives in a dense mesh of active, communicating public objects”. In the end — and one reason cities are so endlessly adaptive and unique — all urban tissue is scar tissue. As we co-create the second city of information and services we need only remember that there are plenty of ways to deal with scars, from covering them up to highlighting them as unique differentiators. (5) It is easy to confuse the use of a system with the need for a system. Confusing usage with need can be a convenient political tactic as it appeals to a superficial kind of “common sense” (e.g., “I do this every day, so obviously I must need to do this every day”), but more often than not it is merely an avoidance of thinking through consequences or distrust that people can adapt to new circumstances. Not only does this happen daily in smaller ways as motorists re-route due to road construction, but it overlooks even more radical examples of transportation infrastructure re-use in cities such as the High Line elevated park in New York City. The use of this linear public space has nothing to do with the need to remove dangerous freight traffic from city streets a century ago. A combination of lucky preservation of a private right-of-way, an engaged and creative public organization, and sufficient sources of funding all allowed one use to supplant another, totally irrespective of need. Churchill supposedly said “We shape our buildings; thereafter they shape us,” but he forgot to close the loop. Our infrastructure certainly shapes us, fostering a sense of needing the uses for which it was designed. But humans are highly adaptive and as our needs change (due often to other effects of the city-as-system) so our usage evolves, changing the shape of the infrastructure itself. This fallacy will be even easier to rest on in the world of rapid prototyping and lightweight deployment of services. The runaway success of Twitter, for instance, is no proof that people needed 140-character status updates. It is proof that Twitter as a service was adaptable enough to accommodate unforeseen kinds of uses. 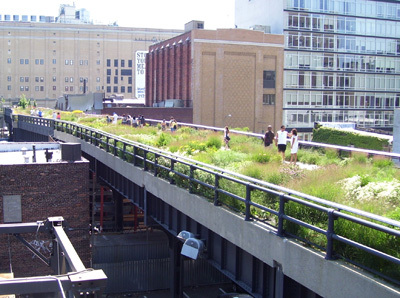 Viewed as a platform rather than a specific application, both Twitter and the elevated metalwork that became the High Line foster new usage in a way that should inform any urban information architecture. (6) Data alone is not sufficient for problem-solving, but an involved community informed with data just might be. A few weeks ago I attended a Chicago community information meeting for residents of the wards impacted by the structural end-of-life of the Western Avenue overpass. This elevated stretch of roadway runs about 1,000 feet and allows motorists traveling north-south on Western to bypass the light at Belmont and Clybourn. It was originally designed to divert traffic away from the crowds that formed at this intersection, the entrance to the once-great Riverview Amusement Park. This viaduct forms part of the western edge of the neighborhood I live in. Like much road infrastructure built in the middle of last century, it needs to come down for reasons of material fatigue. The question is whether to rebuild or try something different. The goal of the informational meeting was to express the city’s point of view in a project to build an at-grade intersection where the viaduct now stands. Like the Central Artery/Rose Kennedy Greenway, much of the environment around the viaduct has responded in the last fifty years by remaking itself into something that no longer needs the pedestrian interaction that so characterized the amusement park intersection before the overpass. One side is big box retail and expansive parking lots (and a massive police station); the other is a somewhat shady assemblage of businesses and residences that do not invite chance inquiry or, if they do, are playing precisely off the hidden nature of their facades (i.e., Underbar and The Viaduct Theater). Adaptability reigns. The session was eye-opening personally, bringing together local residents, three aldermen, and the engineering firm hired to survey the options. Set up like a science fair project, representatives from the firm were stationed at a dozen or so posters that started with the problem and ended with the proposed solution. If you have made it this far in the post you will not be surprised to learn that I favor the deconstruction of the overpass. So I was amazed to hear residents ardently supporting it, not for any transportation benefit it afforded them (a good portion of neighborhood residents must drive out of their way simply to get on it), but for the barrier it forms on the edge of the neighborhood. They preferred the way the wall of concrete prevents people from “cutting through” side streets. Other motorists, presumably not neighborhood residents, loved the unimpeded travel, so rare anywhere in the city. Though how much travel time one can save going 1,000 feet over surface traffic causes one to wonder about perception versus reality. Clearly the data shows that travel times will improve in new at-grade boulevard, right? Well, yes, but even putting aside the opaque methodology and lack of current travel times in the chart, there are so many factors that were not quantified on the chart as to make it suspect. What happens to the non-arterial street traffic? How might travel times at this intersection be affected by the much more substantial plans for diverting (even burying) the intersection at Fullerton/Elston/Damen? With a newly human-scale intersection, have inevitable slow-downs caused by pedestrians been included in the calculations? Perhaps all of these have been accounted for, but it wasn’t obvious and, most importantly, the data isn’t easily reviewable by the public at large. I’m still all for tearing down this blight, but I’m less convinced the method of community engagement deserves praise. Few people who held one conviction left with a different one when the meeting concluded and the city was, in the end, free to proceed with its plans (should funding avail itself). There’s a better way and I believe it can found upon the fertile middle-ground between urban planners and interaction designers — the two communities of practice not noted for close ties at the outset of this post. We’ve got more data about cities than we know what to do with. It’s lying in archives, published on government websites, being sensed from instrumentation in the environment, deduced from aerial imagery, and built from the ground-up by citizens updating, tweeting, and texting a kind of pointillist painting of city life. There’s simply no reason that we can’t design tools to bring city-dwellers into a closer relationship with information that can inform their choices. All the raw materials are there: data, visualization, analytics, and tools for socializing one’s insight or commentary. This would not obviate the need for town hall meetings or public presentation of a city’s plans, but it would equalize the power imbalance, bringing a Jacobsian emergent planning ethic to a suasive critical mass that can interact with top-down planning around a common set of facts. I’ll close by outright quoting Adam Greenfield, a voice in the field of networked urbanism whose echoes you’ve heard throughout this post. I’ve always taught my students that if you scratch a New Yorker, you’ll find a committed urbanist — someone with intense and deeply-held opinions about the kind of trees that ought to be planted along the sidewalks, or the right way to organize bike parking, or ways to reconcile the conflicting needs of dogwalkers and parents with children in city parks. And the same thing, of course, is true of Mancunians, Singaporeans and Cariocas. The point isn’t that all of their notions are going to be fair, practical, practicable or even remotely sensible, but that an immense body of pragmatic insight and — more importantly, in my view — passion for the city is going untapped. Pundits, bobbins and bureaucrats talk constantly about improving the efficiency of municipal services, but if improved information is a driver of that efficiency, why aren’t we even trying to gather all the incredibly rich data that’s just lying there, more or less literally begging us to use it? We have the tools, we have the models, we know what they’re good for and where they fall down. It’s past time to build on this experience and bring its lessons to bear on the places we live. Past time for sure. But not long now. Frameworks for citizen responsiveness, enhanced: Toward a read/write urbanism, Adam Greenfield. Highways to Boulevards, Congress for New Urbanism. The Information Architecture of Cities, Andrew Coward and Nikos A. Salingaros. Planning for Cars in Cities: Planners, Engineers, and Freeways in the 20th Century, Brian Taylor et al. 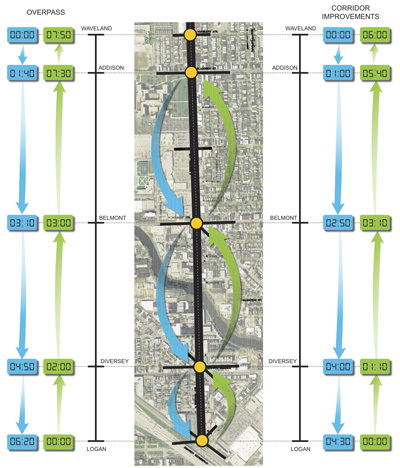 Rethinking Urban Freeways, Mark de la Vergne and Anuj Bhandari. Returning to my info design roots this weekend as I give a talk at the IA Summit in Phoenix on city design. But this one’s a bit different. It’s a call to arms, the other half of a talk I gave last year to architects of the physically-built environment. I’ll be presenting with my grad school colleague and pal, Don Turnbull. Here’s his preview and the full details. UPDATE: Here’s audio from the talk and our slides. Stretching a bit further, I will be speaking at the Metropolitan Planning Council of Chicago on April 21 on a panel called Talking the Walk: The Importance of Pedestrian-Friendly Public Spaces. I’m honored to share 90 minutes with Sam Schwartz and -Joe Gonzalez- Mike Toolis and am fully prepared for quizzical looks as I try to explain the importance of walkability from the perspective of information network design. Full details here. UPDATE: Recap here. BLDGBLOG has a wonderful post up comparing the way the building in the original Die Hard movie is used by the hero John McClane in every way except how it was designed to be used. This is the idea of the building as a network. And it scales up. Our networked technologies already give us this sense of “uninhibited movement” within information space. If we consider the book an architectonic form (the Latin stanza means “room” after all) we see the emergence of the same dynamic of a decade ago when hypertext came into popular consciousness. Hyperlinks and unique IP addresses allowed us relatively uninhibited movement through a landscape of information, jumping to and fro, outside the linearity of the millennia-old codex. I think what BLDGBLOG is pointing out are the cinematic imaginings — and military exigencies — that prefigure the way we increasingly think of the networked urban space as a mutable environment that can be bent to our will. It isn’t uninhibited in the truest sense (there are still walls to be destroyed or network outages to be dealt with), but barriers to movement are less dictated by the grid of streets and buildings than governed by another layer of experience, grounded in data and sensors. 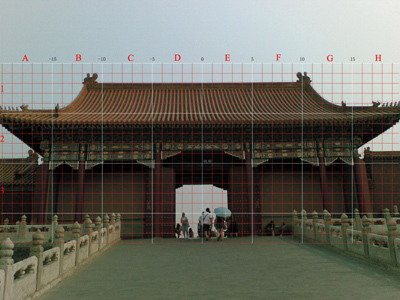 In this condition of total urbanity, maps as navigational tools for the physical traversal of space are supplanted by intelligent maps for navigating a contemporary space in which the physical becomes a layer of data in a global informational space. If that space is created by society, it is also a space that, in its massive complexity, has become unknown to us, a second nature simultaneously also a second city and the space in which today’s identities are being formed. Much of this world is invisible and it is the task of the designer to help us understand it. Intelligent maps — and a least a small number of films — help us think of the city as a platform for our own uses, related to but not wholly confined by the way it was physically built. Of course, all dense, diverse urban areas would have walkscores of 100 if one could walk through walls. But we can’t and I’m not advocating the build-out of a completely porous physical environment or a LEGO-style recombinant cityscape. (Mark Z. Danielewski’s Tardis-like House of Leaves depicts one creepy end of this particular vector.) Constraint is as important as mutability. What’s physically available is as important as the ability to get to it. The video game Portal is interesting to consider as a kind of embodiment of a mutable environment environment that still partakes of rigorous constraint. 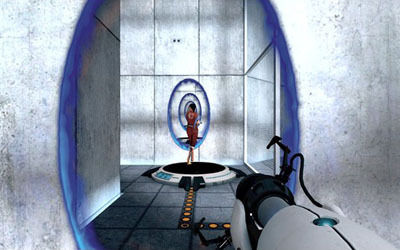 In Portal you move about a highly orthogonal, multi-room architected space with a gun that can blast “entry” and “exit” portals — basically teleporters. You can’t create portals just anywhere, though, and often you’ve link yourself into a corner. It’s surprisingly fun (and good for kids who like blasting things, minus the carnage). The point, I think, is that there’s a certain deep human satisfaction in carving one’s own path, bending a physical space to one’s own needs. Portal, like our tools of networked urbanism, succeeds by meeting that basic human desire. BLDGBLOG makes the point that the Die Hard sequels would not have gotten progressively worse if they had not abandoned the simple premise of a hero who uses a physical space to his own ends, suggesting that scaling Nakatomi plaza up to the level of a city in future installments would have been the logical (and entertaining) next step. I don’t disagree, but we don’t need Hollywood to do it for us. The city of information is being built, piecemeal, by the lived experience of its human actors everyday, an elaborate movie set overlaid on a functioning city street. Recently I was asked by WBEZ, the Chicago NPR affiliate, to write an essay on a topic or trend from 2009 that I would like to see carried forward “from here on out”. What I wrote was a condensation of a year of conferences and talks informed by IBM’s Smarter Cities perspective — all with a Chicago bent. It was an interesting and ultimately enjoyable exercise, whittling down a tough subject into something to be read aloud. I’m grateful to NPR for the opportunity and their collaborative editing. Here’s the link to the transcript and audio on NPR. The actual broadcast, I’m told, will be during All Things Considered on 1/1/2010. Pretty sure the broadcast is Chicago-only. Here is the original essay, which gives a little more context to my screed. This past year offered Chicagoans some unique opportunities to consider our collective identity as a city. We looked forward, dreaming of how we might remake the urban space to host the world and its Olympians in 2016. We looked backward, celebrating Burnham’s 100-year-old vision for what the city might become and, perhaps more interestingly, what it never did become. These two events both asked Chicagoans to imagine a city that did not exist, to grapple with a series of what-ifs about the built environment. And yet, there’s another city — equally intangible — being built even as we move on from the Olympic decision and unrealized bold plans. It is a literal second city, built right atop our architecture of buildings, streets, and sewers. 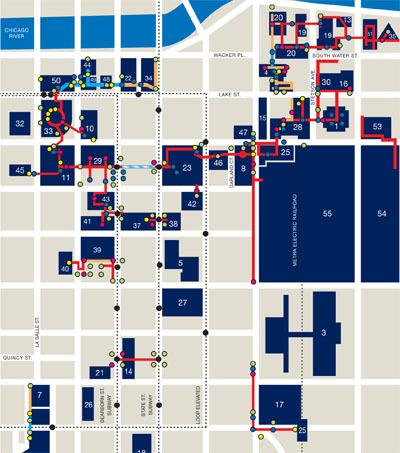 This is the city of data — every bit as complex and vital as our physical infrastructure, but as seemingly unreal (and unrealized) as the what-might-have-beens of Burnham’s Plan and Chicago 2016. 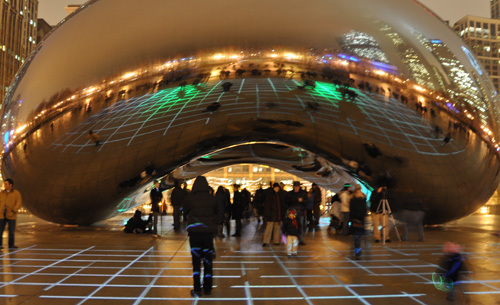 But what is a city of data and why should Chicago care about being one? IT research firm Gartner notes that by the end 2012, 20% of the (non-video) data on the Internet will originate not from humans but from sensors in the environment. If your eyes just glazed over, let’s look at this from a different angle: if Gartner is right, for every four text messages that a pedestrian sends, the sidewalk she is walking on while doing so is also sending an equivalent amount of data. The city itself is becoming part of the Internet. This is happening already. The city is increasingly instrumented; nearly everything today can be monitored, measured, and sensed. There are billions of processors embedded in everything from structural girders to running shoes. 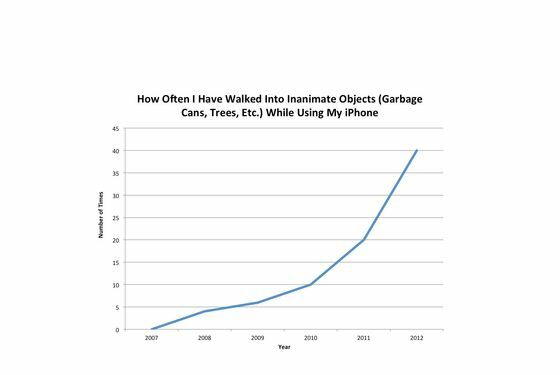 Millions of radio frequency identification tags turn inanimate objects into addressable resources. The city is immersed in a environment of data continuously built and rebuilt from the lived experiences of its occupants. And yet, this information architecture is hardly planned, much less dreamt about, or celebrated. Consider the intersection of Michigan Avenue and Congress Parkway, what Burnham envisioned as a grand pedestrian-friendly concourse leading westward towards a towering civic center and eastward to the lakefront. This was never built, of course. (The circle interchange is our civic center, alas.) And yet there’s another built world, equally intangible, an infrastructure of data, overlaid on this intersection. Three students surf the web thanks to an open WIFI cloud that leaks out of a local hotel lobby. Several GPS units in cars all update with detail about the intersection as they approach. Sensors embedded in the water main below the street register a blockage. Closed-circuit cameras in three different shops capture the same window shopper as he moves down Michigan towards Randolph. An exhausted cyclist’s bike computer uploads his location and energy expenditure as he stops to use his iPhone to log into a Zipcar waiting to take him home. The city 311 database is populated with 7 different service requests from the surrounding area, coming from phone and e-mail. Taxis criss-cross the intersection as their fare data trails are logged locally and broadcast to dispatch. Four different people tweet from different perspectives on the same news crawl that moves across a building’s frontage. A bus stops to pick up passengers and bathes them in the glow of the full-color video screen running along its side. RFID chips on pallets loaded into building docks beneath the street respond to transducers in the receivers’ doorways. And on and on. The examples are commonplace, but together they form an infrastructure — or superstructure — a second set of interactions, invisible or barely visible, atop the interactions that we plan for and currently build for. Proprietary, public, local, remote — all manner of data continuously permeates the streetscape. And yet we scarcely think of how it plays a part in the city that we’re building, the city that we want to become. We don’t dwell on physical city infrastructure much either — unless we’re momentarily captivated by an architectural facade or, more commonly, inconvenienced by some lapse in the expected service. And yet. We’re the city that defines architectural styles for the world, that elevates an urban planner to local celebrity, that engages in a heated debate about the merits of remaking ourselves for the Olympics. From here on out why should we not apply such passion to the next wave of digital infrastructure? It is a decision not to be made lightly or as a thought exercise: how we design our city of information is as vital to quality of life as streets, schools, and job opportunity. Dan Hill, a leading urban designer in matters digital, notes that we often think of the information landscape like street furniture and road signs, as adornment or a supplement to the physical environment. But fissures in a city’s data infrastructure are as consequential as potholes. They are structural failings of a city at the most basic level, in a way that a busted piece of street art would never be. Think of cell phone outages — “dark zones” — as potholes in the urban information landscape. Or consider GPS brownouts, such as cause error in bus-tracking when the CTA enters the satellite-blocking skyscraper canyon of the Loop. But these examples are minor compared to the real issue before us: how do we proactively build a city of information that is inclusionary, robust but flexible, and reflective of a city’s unique character? We have a unique opportunity to ensure that our digital infrastructure avoids the mistakes of our physical infrastructure, to make Chicago the envy not just of building architects but of information architects. I suggest two ways to start. To engage in a dialogue about this new built environment — such as we did collectively this summer — our city planners and citizenry need to be at least as conversant with the language of information architecture as we are, at a basic level, about physical architecture. Call it an aesthetics of data. This is as much a matter of becoming aware of what’s happening around us, of figuring out the most elegant ways of making the unseen felt, of thinking of our urban spaces as I described the interactions at Michigan and Congress. Second, we need to recognize that, while the power of information is the power to connect, every linkage made represents a connection not made or, at worst, a disconnection. (Think again of the unintended effects of expressways on neighborhood mobility.) Our plan for a networked urbanism should seek above all to be maximally enfranchising, lowering barriers to commerce and community. We must take up this mantle and be active participants in the design of this networked urbanism. We must make our voice heard. From educating our elected representatives about the opportunities before us, to encouraging our youth — who increasingly live in a world of data — to think critically about their role in the urban fabric, we must embrace this challenge with the same passion embodied in our historical tradition of remarkable plans for Chicago. If my years had titles, like the Chinese lunar calendar, this would be The Year of the City. October, 2008: I was in Beijing1 to launch the many years of immersion in the design of a special kind of city. Seems almost preordained in hindsight, but this was my primer in designing an environment of information atop a traditional “built” environment. A kind of sandboxed proving ground for urban augmentation. But things were about to change. The economy hit the skids, the US elected a new president, and IBM’s Smarter Planet (and Smarter Cities) strategy was just taking off. Something else happened at the end of last year. For the first time in history more human beings lived in urban areas than not. 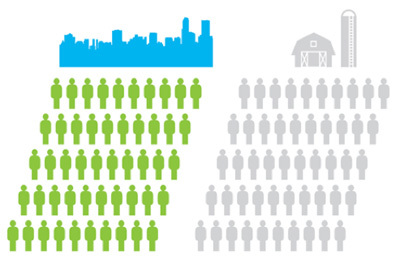 (It is a trend with momentum: by 2050 more than 70% of the world’s population will live in metropolitan areas. )2 Recession or not, it was clear that cities were going to be the nodes for effecting the most change — social, economic, and environmental. Closer to home, my own city was taking a hard look at itself — both how it had lived up to what it wanted to be and how it could be something different in the future. 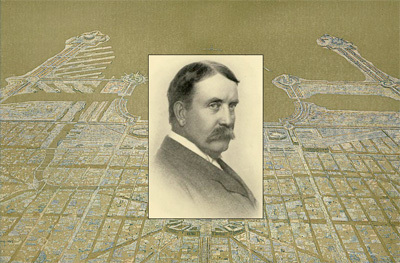 Fresh from the glow of sending one of our own to the White House (and before that was dimmed by an idiot governor), the city began a year of celebrating the 100th anniversary of The Plan of Chicago by Daniel Burnham and John Root. Workshops, concerts, exhibits, tours, dramatizations, even a luminous, gilled pavilion by Zaha Hadid — all commemorations of this seminal document. But the real effect was to focus the city on itself, to look closely, critically, and comparatively at what had been done in a century and what might still be. Of course, this self-awareness was magnified by the competition for the 2016 Olympic games. Our bid spurred much discussion, much dissent, and not a little hope that we’d be able to add a fifth star to the city flag. 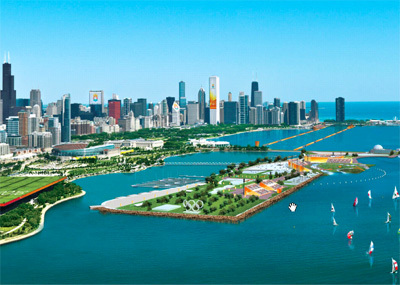 The bid book was a vision of a city re-imagined from the lakefront inward, a big plan to stir hearts, our own virtual city. So if you’re urban-averse, like huge cars and suburban commutes, or otherwise think the metropolis is an earthly hell, fair warning. There’s gonna be a lot of city talk in this neighborhood in the coming year. 1 My last trip out of the country and the first time in a decade that I’ve been so domestic. Dopplr mocks me.